The Tom Dixon Bell Table Lamp in Light Black features a highly polished, mirrored dome that reflects the tone of its surroundings. 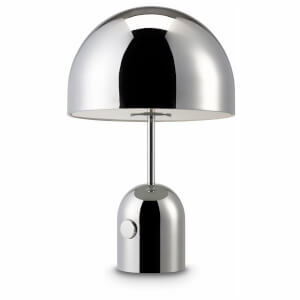 Crafted from sturdy chrome chrome-plated steel, the curvaceous, lamp shade sits on a weighted polished base with an integrated smooth dimmer switch offering a range of ambient lighting options. The eye-catching lamp is perfect for a desk, shelf, bedside or side table and will add a stylish accent to your interior.